As a film or video editor, your job is to work through the recorded raw material and assemble the usable takes into a finished product prepared for broadcasting. Film editor works closely with the director to achieve the desired end result. His role is to go through the camera footage, dialogues, graphics and special effects, and to decide what goes into the final cut and in what way. The film editor uses computer software to alter specific scenes according to the director’s vision. Sometimes, editors are given creative freedom, and they can use traditional methods of cutting the film. However, they are usually obligated to use special software and digital technology to complete the task. Film editors work eight to ten hours a day to help craft a story using a bunch of video footage. Every work day is different and there is no such thing as a typical day in the editing job. They work in edit rooms, trying to figure out how to tell a story by going through the footage shot in the principal photography. The editor constantly reviews the footage and helps in refining the cinematic grammar of a movie. He offers a fresh pair of eyes able to craft a story before it’s sent off to the colorist. 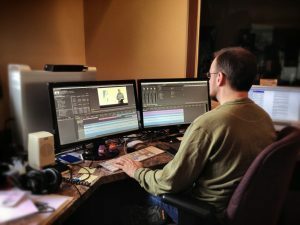 If you want to become a film editor, you don’t necessarily have to get a foundation degree; all it takes is to show commitment and dedication to get into the industry. You can acquire the necessary skills on YouTube as there are plenty of tutorials that walk you through the issue. However, a degree that offers a film or media production experience could help you learn how to use advanced editing software packages, which is highly important for the business. Courses that cover these applications are very expensive, so if you decide to enroll in one, make sure to research them fully to find the one that matches your career choice. Anyone with Internet access can solve the technical problems, but it takes practice and some extra skills to tell a good story. Experience is the key to growing as an editor, so if you aspire to become one, you need to work on as many projects as you can. Film editors are usually employed by film companies, independent production companies, animation companies, video/computer games companies, etc. In the beginning, it’s harder to find jobs, but the more projects editor does, the easier it is for him to meet potential clients. Also, editors that just graduated from college could do internships that could help them get real-world professional experience and expand their contracts. Starting salary for assistant editors employed by a post-production studio is in the range of $22,000 and $28,000. However, film editor job is not an entry-level job, so they start at lower-paid level. When they develop a reputation and get to the position of senior editor, their wage could reach $100,000. Freelance editors usually set their own quotes based on their level of expertise and the project.